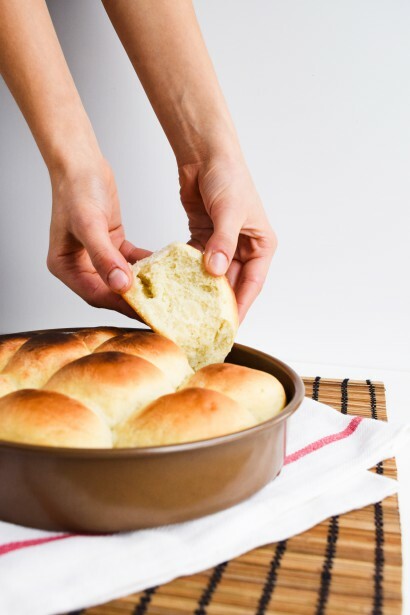 Vegan Dinner Rolls | Tasty Kitchen: A Happy Recipe Community! See post on Elizabeth Shelton’s site! These Vegan Dinner Rolls are light, fluffy, and easy to make! In a bowl, combine water and milk and heat until mixture is warm. You don’t want it to be too hot or the yeast will die. Stir in yeast and sugar. Let sit for 5 minutes. In a mixing bowl, whisk flour and salt. Add yeast mixture and oil to dry ingredients and beat until a soft dough is formed. Transfer to a lightly floured surface and knead until smooth and elastic. Let rest 10 minutes. Divide dough into 10 to 12 pieces, shape into balls, and place in a greased 8×8 dish or 8-inch round pan. Cover and let rise in a warm place until doubled in size, about 30–45 minutes. Preheat oven to 375ºF and brush the tops with additional oil (optional). Bake for 20–22 minutes, then broil on high for 2 minutes or until golden brown.